No matter the size of your garden, there’s a little tree just for you, perfect to add style and substance to that corner you’ve been meaning to revamp. Now’s the time to decide which one little tree is right for you. A tree automatically adds focus and maturity to any garden, and a distinct, natural touch. Trees provide the ultimate shelter, nesting sites and food for birds and other wildlife, and bring year-round joy in leaf, berry and flower. If home-grown beauty is important to you, plump for a native. Crab apples, holly and rowan all stay very compact, never usually reaching more than 8m tall at the very most. All will grow in most locations, as is the natural wont of a native, and some don’t mind a bit of shade, particularly holly. The crab apple variety ‘Admiration’ is naturally dwarf, available from www.crocus.co.uk, and reaches 4m tall. Grow it in a large pot and it’ll be perfectly happy. There are many trees you can pop in a pot – not all native, though. Acers are a prime example, fantastically colourful little trees that are slow-growing and real stand-out features. The very best are ‘Osakazuki’, a flaming scarlet-leaved beauty in autumn, or one of the dissected-leaved types, such as green and red-tinged ‘Emerald Lace’. Use a slightly acidic compost, with equal parts soil-based John Innes mixed with ericaceous. If your plants jostle for air space, go for a columnar species, such as the slim cherry tree ‘Amanogawa’, covered in lovely cherry blooms in spring but with upright stems that stay pencil thin. For a sense of permanence and year-round structure, even though you might have very little space, you can plant up a mini forest of dwarf conifers. No need for a great big, overbearing leylandii! You can get a whole range of colours – juniper ‘Blue Star’ is one such bright blue beauty, at 40cm tall and a metre wide, and tiny spruce ‘JW Daisy’s White’ is a delight in yellow-white. To finish off your colourful trio, fluffy little Pinus mugo ‘Humpy’ is a charmingly named rounded pine in dark green. Add them to an alpine planting scheme for superb effect. Clustered bunches of berries all along each stem. Plant up a red, yellow and orange berry bonanza for hungry birds. 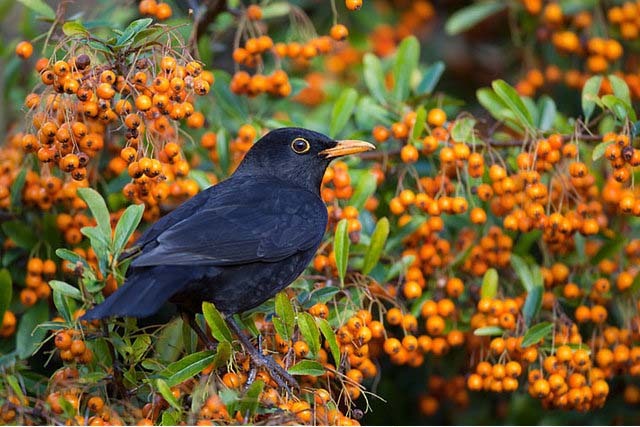 Lovely leaf colour and berries and the perfect hedge plant – provides food and an excellent, safe home for birds’ nesting sites. The original utility hedge that earns its keep as a dense hedge, full of plentiful berries that stay put for birds to feast on.